Door Step School, Pune. 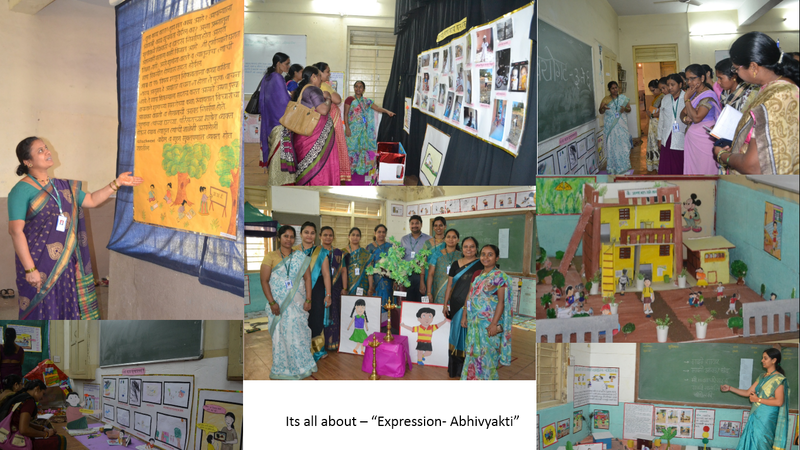 : DSS Exhibition on “Expression”, an approach to deliver awareness on meaningful communication and educating children. DSS Exhibition on “Expression”, an approach to deliver awareness on meaningful communication and educating children. The Society for Door Step Schools (DSS) has been taking education to the doorstep of underprivileged children since 1988-89 in Mumbai and 1993 in Pune. Through various programs DSS tries to reach the often forgotten children from the marginalized sections of society like children of construction labourers, pavement dwellers and many others. These children are enrolled to Government schools and taught basic literacy and mathematics skills at our centers through various innovative and creative teaching methods. Our teachers are regularly trained and their skills are further honed at DSS Training Center – “Parivartan” which stands as the backbone of DSS since 2007. Every year Parivartan organizes an exhibition with the aim to provide guidance in relevant topics and specifically targeted for teachers and other field staff. This year too, DSS welcomed the New Year with their first event – The Annual Training Center Exhibition and the topic was “Expression- Abhivyakti”. It was organized from January 10th to 17th at the Center in Annabhau Sathe School, Sadashiv Peth, Pune. The time and effort put in by the entire Training team in planning and organizing the event was evident from the various meaningful props and ideas they used to deliver the message of how important it is to understand one’s expression especially while interacting with children. Various charts and models were exhibited demonstrating how expression shifts in children & teens and how it leads to a mutually beneficial dialogue. Through a variety of examples, trainers explained the concept of expression particularly between the age groups of 3-6, 7-11 and 12-16. The aim was to educate DSS teachers, trainers from other schools or institutions on listening, understanding and communicating; where children can boost their language development and give them an advantage they may not otherwise have. Knowing how to listen and join in conversations is an art of encouraging individuals to come out of their little world outside, to a more socially inclusive community. It was very enriching to explore how the team categorized their study within age groups on topics like, ‘my family, my individuality, my neighbourhood, my social responsibility, my hobbies, my school, my dreams, our social media etc’. There was some take away for each and every person making them more aware about their surroundings along with their commitment to themselves and their community. Clockwise from bottom left: A DSS teacher noting points, followed by our trainers explaining charts, A school Model and another of our trainers explaining charts & models. Center: DSS Training Team.